flight into a sweaty oven of an airport terminal. Now to the baggage claim. a local for suggestions. All red bags became potential targets. This one? the corner. Checking the tag. Yes! voices increasing with each step. Now to find a taxi. waiting, explaining. Here’s the money. Thank you. Taxi this way? Okay. sweat, an array of blue, yellow and white cars, and . . .there it is! Into the taxi and now through the city. Honking, braking, acceleration. in for increased road space, speckles of paint and dent on cars corners. missing side mirror by a centimeter. and the beauty of human interaction. Four cars wide in a three-lane road. Horns are their voices. Steaming tires are their shoes. And I wonder for myself, how is this possible? 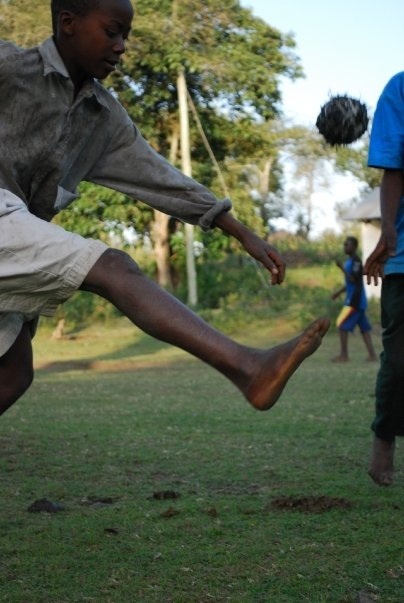 What’s the real social power of football in contemporary societies? It seems to be much more than just pure leisure; much more than a simple competition; much more than just pure business. 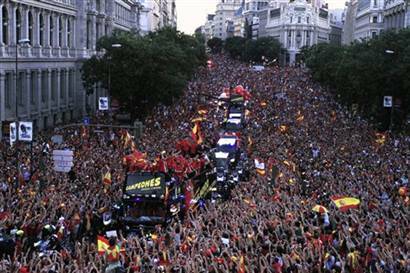 Yesterday there was a huge party all around Madrid, a welcoming party for the team players organised by the government. It was one of the biggest concentrations of people in the entire contemporary history of the country, hundreds of thousands of people partying in the streets, all dressed with red shirts. Spanish flags all over the city, everybody waving the national symbols, feeling (or at least pretending to feel) united. It is just something nobody could expect. Yesterday it seemed like there weren’t any kind of social distances, any kind of regional nationalisms. It was the first time you could here people from all different political ideologies, immigrants who are structural and politically marginalised, screaming out loud: Viva España! Viva España, one of the most common expressions associated with our own historical past, with Franco’s dictatorship, with a kind of nationalism that is being constantly disapproved by an enormous amount of people who still feel the necessity to fight against fascism. But, two days after the finals, we came back to real life again. We came back to our one political and economical situation. Nowadays Spain is one of the European countries where the current crisis has had its more perverse social effects, where unemployment rates are the highest and where the political system has lost most of its social legitimization. But it seemed that, at least for two days, this was something people could forget about. It seemed as if people could, once again, feel proud of their country. But what about the way in which the government has strategically used this fleeting social amnesia? It is not a coincidence that the government decided to make public the new labour market reform the same day in which the Spanish team made its debut in the World Cup. It is not a coincidence the enormous amount of money invested in this victory. And I ask myself again, what’s the real social power of football in contemporary societies? How can we feel proud of a country that it is being socially devastated? Maybe we, as anthropologist, should start asking people what football really means to them so as to know more deeply the social implications it has. It seems to be much more than just football, more than just mere business…. Kazuyo: I have arrived to India. Wow, here is my quick update/cultural experience of arriving to India. Even at ORD airport, the gate heading to India had a little more chaotic feeling to it. Not an unpleasant one. It’s just didn’t feel ordinary. Let’s say compared to getting on a flight to go to Tokyo, it was distinctively different. Some Caucasian people brave to Indians lines, and they seem to have gotten through. Not a problem. So those who are standing in line for foreigners wait patiently and finally, two immigration officers shows up to foreigners’ lines. No question asked, they look at my passport, visa and give my passport back. No questioning of why I am there, etc., the general customary questions immigration officers ask. I don’t find an ATM machine. I am glad that I had some US dollar in cash and exchange at the bank. I am sure that the rate isn’t great, but I have Indian rupees now. Go through custom, and there are lines with people with signs picking up mostly foreigners. I see a sign saying “Pre-paid taxi,” but be aware those are who pretend to be taxi drivers. So I go to the counter and it says CLOSE. I wonder, ok, what now? Then I go to Jet Airways help desk to see if I can get a boarding pass for tomorrow. But there is a couple who apparently have their luggage damaged and are going through the claim. After standing in line for 15 minutes, they tell me that I need to go to domestic terminal for that. Finally, I venture out to the arrival area and I see 3 windows for Pre-Paid taxi again. I quickly get in line, 5 minutes pass, 10 minutes pass. The line is not moving at ALL. After 15 minutes of waiting, I ask a gentleman in front of me, what is going on. He says traffic is so bad, there aren’t enough taxi. So just wait. Meanwhile, everybody in the line is calling SOMEBODY trying to get a taxi or a ride. I tried to call my hotel, but I was not smart enough to program how to call India on my phone and my call fails repeatedly. So text for help to Melinda. While I am waiting, checking my emails, and trying to be patient. People are yelling and getting upset at the window, so the guy leaves. I am starting to wonder whether I have to spend a night at an airport tonight. Finally, 2 people come back to the window after 30 minutes or so waiting, and a line to the window (somewhat a line, but not a straight line) breaks out and people start rushing and running to the window. There are two Asian women who were behind me and they run in front of me to get to another window. I yell at them, “Hey, you were behind me.” They say, “well, you were too slow, besides you were waiting in that line, not this line.” They smirk me a look and wait for their turn. I think to myself, “is there any order here?” It’s just the beginning, I realize later. Finally, I get to my turn and the window person tells me that it would be 310 rupees. I tell give him 400 rupees and he tells me that I need give him 10 rupee. I tell him I don’t have it since I just landed. He gives me back 100 rupees and charges me 300 rupee instead of 310. It’s hot, loud, people yelling and shouting. I am thinking that it definitely has different energy compared to the Philippines. The only word that comes to me is chaos, but it’s not the right terminology. I wait and wait and finally a taxi comes up and I get in. It’s HOT and HUMID. I can hardly breath. 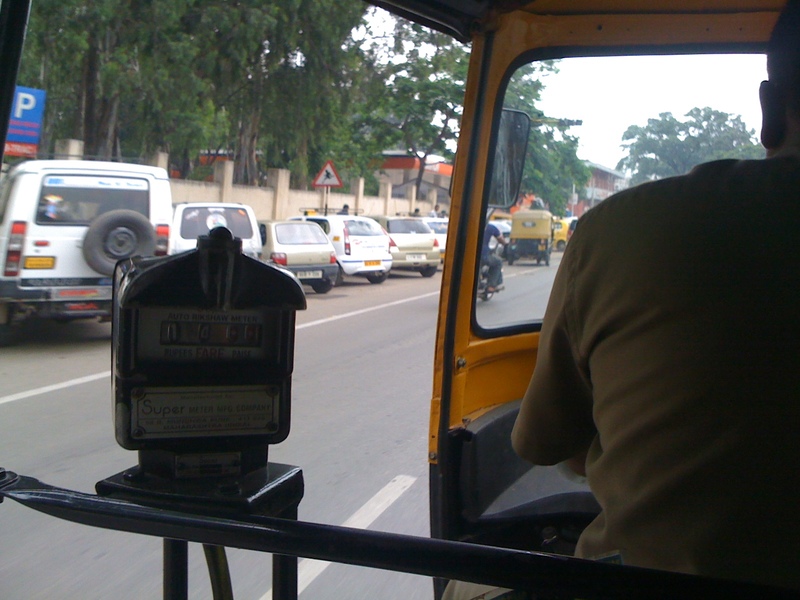 Taxi person is very nice and asks me if it’s the first time India for me, I say yes. The traffic is jammed, and the road is packed. I see people hanging on the side of the car—I have seen this on photos, but people really DO that! We drive through and spend maybe 20-25 minutes in the car, perhaps for 5 minutes when there is no traffic (another guy in line told me that it would be 5 minutes to the hotel from the airport). At the toll booth, a man with a stick is checking underneath of trucks—I wonder if they are checking for bombs? Or something being smuggled???? We drive by the field with burning tires (smell indicated that), honking traffic, people randomly stopping on the side of the road. I see squatters and also smell curry. Curry smells GOOD for sure, “Perhaps I will try something right before I leave India,” I think to myself. I am thinking that it kind of reminds me of a combination of Manila and Kaoshang night market. And suddenly, we pull into a gated area with a mall and that is where the hotel is. Separated from the rest of the chaos, but right next to the highway! This is definitely a beginning of an adventure, I think to myself. Kazuyo and John are headed to India. In fact, Kazuyo is probably on a plane as we speak, and John will join her in a little over a week. We’ve traveled all over the world and our stop in India is a new place for us, so we’re pretty excited. They’re headed to Mumbai, Bangalore and Ludhiana and will hang out with a local Indian ethnographer and other folks as they learn all about luxury lifestyle. Yeah…Taj Palace, Juhu Beach, downtown Ludhiana, and so on. Kazuyo learned during her trip to the Philippines several years ago that eating mangoes (a hot fruit) every single day didn’t go very far in helping her avoid heat exhaustion, so this time she’s going to skip hot fruits as the temperature climbs. Kazuyo lives in Boston, so as far as she’s concerned, gray skies and cold weather is much more her style. John’s excited too. While he knows “India has an extremely rich and interesting culture, packed with an assortment of languages and traditions, and a rapidly growing economy,” he will learn firsthand what that looks like, how it sounds, and what’s changing right now. But he’s certainly not looking forward to the long plane ride. It takes 24 hours to get there! Stay tuned AFTER the trip. We are sure that there will be some good stories to share! As the world’s most watched sport, soccer [or football as it’s know throughout much of the world] dates back thousands of years. In this year’s World Cup in South Africa, 32 teams will battle for glory, each carrying forth a tradition of honor in the hopes of being propelled into elite status by bringing home the golden cup. While some sources, such as EA Sports, predict Spain will defeat Brazil in the finals to take the cup, others have used quantitative methods to name England the 2010 champion. We’re excited. Not because we care who wins. Our summer includes several stops in Europe and Asia as we conduct fieldwork for a variety of projects. What excites us is learning a whole lot more about the social worlds undoubtedly living in a fever pitch from June to July 11. Did you know that Asia predicts a record number of World Cup viewers this summer? Being there, where the fans will be living and working, we’ll be able to tell you a thing or two about why this World Cup differs from the tourneys of year’s past.